Mention the word tarantula and most of us will conjure up images of a large, hairy and treacherous spider. The tarantula, a member of the Theraphosidae family of arachnids, has long held a scary and loathsome reputation, but not usually because people fear its noisiness. Despite this, some tarantulas do, in fact, make noise. Arachnophobia -- a fear of spiders -- is one of the most common fears in the world, but there may be less reason to fear some tarantulas than you think. In addition to rearing up on their hind legs in a defensive stance, some tarantulas make a hissing or rasping noise as a defense against threat, warning predators (and humans) to stay away. This noise, called stridulation, is not made by its mouth but, instead, created when the spider rubs specialized bristles on its hind legs together. According to experts at The National Zoo, this noise may be heard up to 15 feet away, so it could be considered quite loud. This noise can warn humans to leave the tarantula alone, avoiding a bite or irritation and swelling that can result from contact with tiny urticating (barbed) hairs flung from the tarantula’s abdomen. The largest spider in the world, the goliath bird-eating spider (Theraphosa blondi), is among tarantulas that make a defensive noise when threatened. 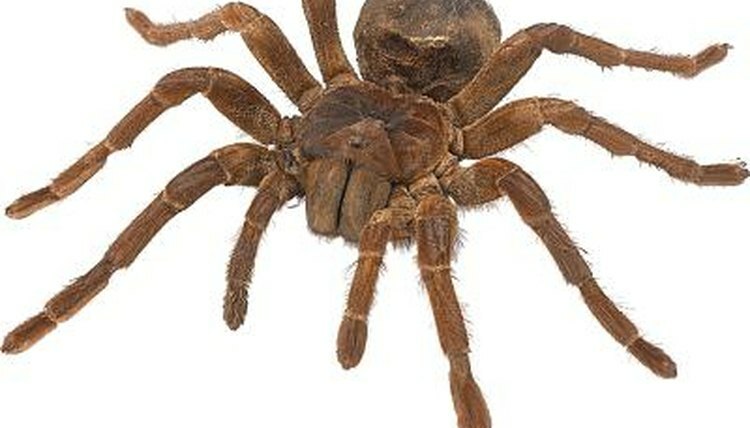 This jumbo-sized tarantula is considered aggressive and is not recommended as a pet. Other well-known noisemakers of the arachnid world are the king baboon spider (Citharischius crawshayi) and the mombasa golden starburst tarantula (Pterinochilus murinus), also considered more aggressive than most other tarantulas. Noisy tarantulas are in stark contrast to quiet species such as the Chilean rose-haired tarantula (Grammostola rosea), a generally good-natured, hardy spider with rose-tinted hair, and the pinktoe tarantula (Avicularia avicularia), a very fuzzy, relatively tolerant spider that sports pink-orange toes. Both make ideal pets due to their docile temperament. Rather than fear spiders, especially large, hairy tarantulas, understand that most tarantulas with aggressive tendencies will vocally warn you to stay away before inflicting harm. Plus, any harm they may cause is nonlethal. And tarantulas that don’t make a sound are typically docile and much more likely to run away than attack you. Knowledge is your best defense, especially when it comes to tarantulas. NationalZoo.com: Meet Our Animals Q: What’s Huge, Hairy, Has Fangs and an Attitude? A: The Goliath Bird-Eating Tarantula! Do All Spiders Have Hair on Their Bodies?